“Genius,” Thomas Edison famously said, “is 1 percent inspiration and 99 percent perspiration.” He would have found a kindred spirit in Elif Bilgin, 16, of Istanbul, winner of the 2013 Science in Action Award, part of the third annual Google Science Fair. The $50,000 award, sponsored by Scientific American, honors a project by teens from 13 to 18 that can make a practical difference by addressing an environmental, health or resources challenge. Bilgin spent two years developing a robust bioplastic from discarded banana peels, enduring 10 failed trials along the way. As she noted in her project description: “Even Thomas Edison said, ‘I have not failed. I have just found 10,000 ways that won't work.’” Bilgin hopes that her material will someday supplant some petroleum-based plastics. She is also a finalist in the Google Science Fair and will join 14 other contenders at the company's California headquarters in September for the awards event. 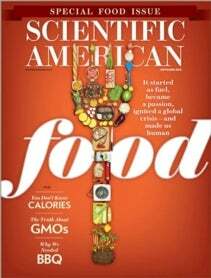 Bilgin talked with Scientific American about her inspirations and her aims for the bioplastic project. Excerpts follow. How does your project affect your community? Istanbul is a very big and crowded city. With so many people using electricity on a daily basis—whether it is to charge their cell phones or to use their TV—a lot of cables must be used throughout the city. My project makes it possible to use banana peels, a waste material that is thrown away almost every day, in the electrical insulation of cables. This has the potential to decrease the amount of pollution created from the use of plastics. Marie Curie has been a major inspiration and a role model, being a female scientist who devoted her life to her study of radioactivity and challenged gender norms along the way. If you could travel through time, what innovation would you introduce 100 years early? As a huge science-fiction fan, I wouldn't accept the opportunity to go back in time and introduce an invention or discovery. I wouldn't want to disrupt the spacetime continuum! But if I had to give an answer, it would be introducing a treatment for cholera. This act would save many lives. Rachel Scheer is Head of Communications, USA for Springer Nature. She works across Springer Nature working with brands such as Scientific American, Nature Research and BMC.